The Bognor Friday Night Summer Darts League held their divisional trebles knockouts at the Newtown Social Club. With 31 teams in attendance, it was the second best turnout in at least 13 years. The division-three knockout saw 11 teams take to the oche. The first semi-final saw Graeme Dutton, Jill Mitchell and Mark Wingate (Newtown Clubbers) beat Joe Osman, Shane Warner and Tim McCarthy (QE2 Lions). The second semi saw Glo Greene, Des Ling and Debbie Ling (BRSA ‘B’) go out to Simon Edwards, Tom O’Sullivan and Michael Hoare (Richmond ‘B’). The division-three final saw the Richmond B start and take the lead, scores of 85 and 121 from Dutton, and 95 from Wingate saw them pull it back. Eventually O’Sullivan stepped up to take the first leg. Eventually it was Hoare who hit double one with his second dart to take the leg and the division-three trebles champions title for the Richmond B. The second leg saw a closer leg all the way to the double. Eventually it was Hoare who hit double one with his second dart to take the leg and the division-three trebles champions title for the Richmond B. Division two also saw 11 teams take part. One match in the preliminary round saw the only 180 of the night come from Larry Chant (Aldwick Legion). 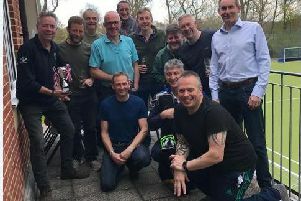 The first semi-final saw Len Dixey, Gary Harwood and Les Mullinder (Royal Oak) beat Richard Pennels and Stuart Gray (BRSA Ravens) and their partner Paul Bizzell (QE2 Devils). The second semi saw Andy Chant and Ian Dendy (Aldwick Legion) team up with Lee Hellyer (Newtown Amity) to beat Debbie Clements (Royal Oak) and Colin Ragless & Dave Wingate (Friary ‘D’). The division-two final saw Chant, Dendy and Hellyer win nearest the bull to go first, and Hellyer stepped up and hit double 16 to take the first leg. Leg two saw Chant, Dendy & Hellyer take the lead, and end with Dendy hitting double one to take the leg, and the division-two trebles title. Division one saw nine teams step up. The first semi-final saw Tony Phillips, Mark Sheppard and Andy Stubbs (Hunston Hares) lose to Lee Franklin, Billy Collins and Rob Collins (Friary ‘Z’). The second semi-final saw Richard Ragless, Micky Rowland and Dave Owens (Friary ‘Z’) defeat Andy Cooper, Buster Barton and Derrick Longhurst (Claremont). The final started with Rob Collins winning the bullseye for first darts, and after a le of twists and turns, Franklin clinched it. The second leg saw Collins hit 84 and 123, followed by another 123 from Franklin. Ragless had a chance at double top which he took to take the game to 1-1. Rowland started the last leg with 85, but Franklin struck 140. Owens followed that with his own 140, but Collins hit a ton in reply. Collins junior and Franklin missed chances at the double, leaving Owens needing double eight, which he found to take the leg and the division-one title.